The 36th annual Battle of Dematagoda inter school cricket encounter between the traditional rivals St. Mathews College and St. John’s College will be worked off on March 15 at Campbell Park. This year’s match is organised by the Oldboys Association of St. Mathews College Dematagoda. Third year coloursman and all rounder Kasun Rukshan will captain St. Mathews College team while Anthony David will lead St. John’s College team. St. John’s College 1st eleven cricket pool. Seated (from left): Pathum Madushanka, Anthony David (captain), H. G. P. Lakshman (master-in-charge), D. A. P. Dharmasiri (Principal), Nayanajith Dias (vice captain), M. Z. M. Fazil. 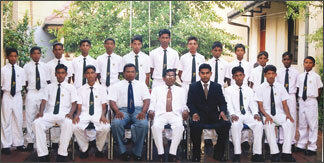 Standing (from left): A. Divakar, S. Umarsan, M. Fahim, A. J. M. Jassim, M. F. M. Areeb, T. Asmideen, M. A. N. Asnaf, Nadeera Madushan. St. Mathews College 1st eleven cricket pool. 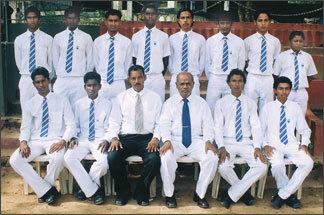 Seated (from left): Nilantha Jayaweera, Joseph Dixon (vice captain), Nishantha Edirisooriya (coach), Jayantha Mohattala (Principal), Subash Karunaratne (master-in-charge), Kasun Rukshan (captain), Tharaka Madushanka. Standing (from left): M. Mashood, Namal Sampath, P. Sudarshana, Damith Sanjeewa, Ijaz Ahmen, M. Safraz, T. Dinone, Imran Reeza, Vinod Kumar, Darshana Sanjeewa, Chanaka Nishantha, Rajan Anushan, Nipuna Madushanka.